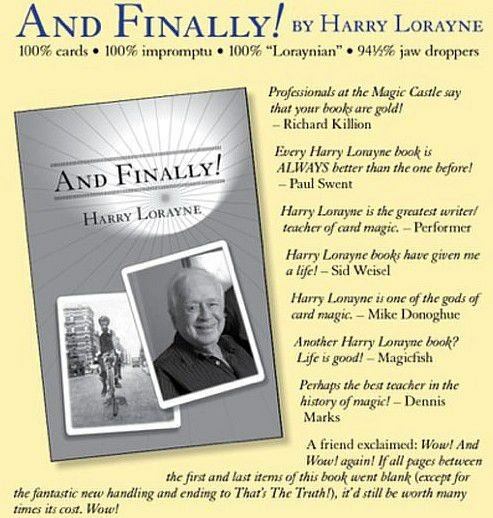 Few living magicians are as respected and prolific as Harry Lorayne. Besides the huge influence he's had in another area of his expertise - memory training - he's enjoyed a very successful career as a magician and entertainer. Now aged 92, he's highly regarded in the magic community for his immense contribution to magic literature, with many fine volumes bearing his name, including his classic Close-Up Card Magic (1962). The latest addition to this impressive collection of Harry Lorayne books is his newest title And Finally! (2018). 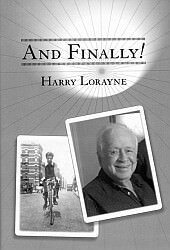 After dozens of books and millions of copies, could it really be true that this is actually Harry Lorayne's final book? Well it's arrived in print, is now available, and it's not just the title that makes a clear statement about that. Already in his "Foreword" Harry Lorayne insists that this is his last book: "But this really HAS to be my last book because a) I really, really, have nothing important left to say and b) C'mon - I'm ninety-two years old as I write this and I'll be near 93 years old when the book appears - if I'm still vertical. So, how can this be anything BUT my last book?" It is reiterated on the last page of the book: "Well, I've gone over everything in this, my last, book ... I've been told that I leave quite a legacy with my quite-a-few books in my two areas of expertise - magic and memory. I'm hoping that this book will be an important part of that `legacy'." So what is included? And Finally! doesn't depart significantly from the winning Harry Lorayne formula, both in terms of presentation and content. It's just as anyone familiar with his work might expect: another Lorayne book in a finely produced hard cover, consisting of around 250 pages of quality content. His previous book, Jaw Droppers Two, came about when Harry was going through some of his own books like Best of Friends, and came across scribbled notes that brought to mind ideas old and new, along with revised handlings of some of the tricks included there. And Finally! is the result of a similar process, and is effectively a re-writing and updating of selected content from his long out-of-print Personal Collection (2001), along with improved routines and items he's never published before. As Harry himself concedes, it could equally have been called Jaw Droppers Three, but the title And Finally seemed more appropriate. But this is by no means just an updated Personal Collection. You can see the table of contents for that older book here and here, and the table of contents for And Finally! looks entirely different. There is some overlap in the content, of course, but Harry has also included updated routines for tricks found in some of his other out-of-print books, as well as some new material. It's hard to pick the best material from a collection that has a wealth of good magic. But you will find proven classics like the "Lazy Man's Card Trick" (p.213), and not-to-be-missed routines like "That's The Truth" (p.111). I am especially partial to the presentation Harry Lorayne offers with "Really!" (p.75) which you can see him perform as part of his 90th birthday lecture here. Equally entertaining is one of Lorayne's own favourites, "Jacks Are Better" (p.90), which employs the Lorayne Force and Universal Reversal to good effect, as efforts to find a selection first produce the Jacks, and these in turn reveal the chosen card. "Mental Vibrations" (p.166) is based on a great Bob Farmer idea, and ends with a spectator finding a card they'd thought of in their very hand. The material is quite varied, although expect to see the content gravitate towards the usual Harry Lorayne favourites, like Ace and four-of-a-kind routines, some gambling routines, and tricks involving mates and royals. It's all card magic, of course, and Harry's fondness for impromptu tricks shines through strongly. In terms of difficulty, the majority of this material is very accessible, and an intermediate ability with card magic will be the stepping stone you need to get into these routines quickly. As always, Harry doesn't just teach some great routines, but also includes instruction for a number of very handy utility moves, and you'll find explanations for all of these in this new book as well. Examples include: Utility Mixer, Reverse Faro Ending, Bottom Stet Overhand Control, Angle Spread, The Lorayne Force, The Lorayne Spin, Magician's Choice, Illogical Double Lift, Status Quo Shuffle, Universal Reversal, HaLo Thumb Push-Up, and the HaLo Cut. Throughout his writing career, Mr Lorayne has demonstrated a remarkable ability to communicate clearly and accurately with words, and this new volume exhibits this rare gift once again. His warm conversational style makes for pleasant reading. He has been criticized in the past that this casual approach sometimes comes at the expense of careful crediting, and if that's a concern you've had with his earlier writings, this new book isn't likely to change your opinion. He does, however, include a section at the very end entitled "Pinpointing An Era", which consists of two solid pages of name-dropping of famous names that he considers as personal friends throughout his career. Given the title of this book, and that it's likely to be a book-end to a life-time of written work about card magic, it's only fitting that I let Harry himself have the final say, by sharing the final paragraph from his "Last Word", as found on the final page of this final book: "For me, magic sure has been a long, interesting, important, fascinating, life-changing, friend-making, ego feeding, inspirational, flattering, amazing, enjoyable, fortunate, incredible, rewarding, exciting, awesome, lifetime journey and experience. Thank You." Mr Harry Lorayne, from us to you: Thank you! And Finally! is only available directly from Harry Lorayne ( http://harryloraynemagic.com ) and is priced at $79.95 plus shipping/handling. I bet it isn't his last book! However, he might have a bit of trouble figuring out the title for the next one! Perhaps "Second Final"? Steve, always enjoy and appreciate your reviews. I was interested in this summary. I kind of felt you were a little lukewarm towards it. Obviously, I misinterpreted the review. Not lukewarm at all! I was extremely happy with this book. I usually try to highlight five tricks or so but found that impossible with Harry's latest. I couldn't limit my notes to only five. Indeed, looking at the review myself I was moved to spend today rehearsing a couple for any performance opportunities this evening. Nice! Will definitely check this one out. performer wrote: I bet it isn't his last book! However, he might have a bit of trouble figuring out the title for the next one! Perhaps "Second Final"? How about "Encore"? Or, "By Popular Demand"?